Product Description The Aquis-I circulating bath is controlled by a microprocessor that allows the temperature to be precisely maintained. 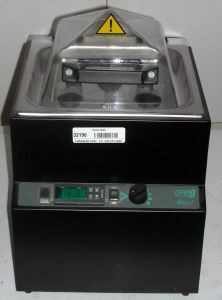 The 5-position magnetic stirring system provides direct sample agitation, when stirring bars are placed within the sample container. Unused stirring positions are used to circulate the water within the chamber. This ensures good temperature uniformity. Temperature range is up to 99°C with the lid. Tank capacity is 8L.